The common plan is to put funds towards your retirement during your working life which will ensure that you will have a comfortable life when you stop working, although that isn’t the case for everyone. If you haven’t been saving for retirement, you can still make a plan to have a comfortable life after your working years; you can earn retirement income from real estate investing. 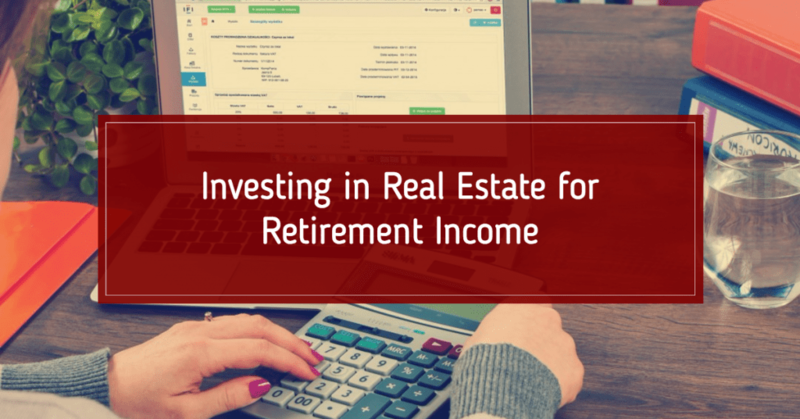 Investing in real estate for retirement income is a great way to earn monthly cash flow. Retirement should give you the opportunity to have the time to do all the things that you never had the time to do when you working. Rental income can be passive, giving you the opportunity to travel, spend time with family and other things that you enjoy doing. You can hire a property manager to take care of repairs, maintenance and to ensure that tenants pay on time. If you were not putting money aside to acquire property that you can rent out for income when you were working, acquiring it when you are close to retirement or when you have already retired can be harder. After the housing market crash a few years ago, lenders are very vigilant about whom they lend to. They require a larger down payment and they charge more interest for rental property compared to owner-occupied property. Another risk is that you may rent out to renters who give you a problem with paying their rent on time. However, this is a problem that can be avoided by screening potential renters very carefully. As a landlord, you are allowed to look into the character and background of those looking to rent property from you and you are allowed to verify the information they give you. Seasoned property managers and turnkey providers can alleviate this worry and keep your investment property continuously rented. There is a growing trend in real estate investing and it is turnkey real estate. The way this form of investing works is that an investor buys property and leaves it to a third party to run. This certainly works for one who wants to earn passive income while enjoying their retirement. This form of real estate is called turn key because the idea of is to buy a property that is ready for occupation by tenants with the turn of a key. There are many turnkey real estate providers and they work differently. Some buy and renovate property, find renters then sell it to an investor. Others will simply help you find property which you will get ready for occupation by tenants then put in the hands of property managers to find tenants and handle them. Turnkey companies operate a bit differently but they have the same goal of making investment property easier for investors. It is important to take the time to understand how the turnkey companies you are considering works. It is also worth it to take the time to understand the implications. Your property managers will handle tenants and the property for a fee. You will need to choose a property manager that will sell you the property at a fair price and that will faithfully manage your returns from the property. You can invest in real estate without the hassle and stress of being a property manager by investing in turnkey properties; you will have income to live on in your retirement and you will have the time to spend your post-working years indulging in your interests and hobbies.